Boredom in Dogs- It is more common than you think! As dog owners, we all want our pets to be happy. We feed them and give them treats, pats and some of them are allowed to hang out on the furniture with us. As much as we wish it were true, most of the time our pets aren’t the couch potatoes we think they are - they are just doing what pleases us. In fact dogs need to be mentally and physically stimulated to be happy. Dogs are thinking creatures with natural instincts such a digging, chasing, hunting and socialising and are happiest when part of a pack. We humans need to be this pack and provide opportunities for our canine companions to fulfil their basics instincts and social needs. If we don’t we end up with either an unhappy best friend or a dog that develops undesirable behaviours as it tries to fulfil it's own needs. Some of these undesirable behaviours may include excessive barking , whining for attention, escaping from the yard, destructive behaviour (chewing shoes, furniture or other items, pulling clothes off the line), inappropriate digging, chasing cars or even inter-dog aggression. We must understand that many of these behaviours are natural for dogs however we just term them bad behaviours as we find them undesirable. Being aware that dogs suffer from boredom and working to prevent this is a part of responsible pet ownership. Creating a stimulation to an animals life is called 'enrichment'. * Walking allows your pet to explore another environment, where they can absorb new smells, sights and sounds, therefore it provides mental stimulation. When you walk your pet it teaches them that it is ok to explore the outside environment when you are present. This reduces the likelihood of them wanting to escape from your yard as they know there is a correct time to explore, that is when the owner (pack) is present and that they aren’t going to “miss out”. Remember: Denying walks denies a great training and socialising opportunity. * Games of hide and seek are wonderful! One person hides and another gets the dog to go find. Once the hiding person is found, ensure you positively reinforce this behaviour by offering a reward - toy is tossed for the dog, a treat is given, a physical reward such as a pat or a verbal reward (say “Good dog”)spoken in a happy voice. * Alternatively, hide a toy for the dog to find. Start simple (behind a chair in the same room or open yard space) and build up the complexity (behind a tree, under a box in the hallway etc). Kong toys are great! They come in various styles and types and include one for puppies, teeth cleaning styles, heavy duty ones (for dogs that try to destroy toys when they chew). These toys can be filled with spreads, cubed cheese, canned dog food, treats or other recipes (visit the website ww.kongcompany.com/recipes). You can give them to your dog before you go out so they have an item to provide them with mental stimulation while you are gone. Remember that treats are just that ‘a treat’ and should not replace quality nutrition (a complete and balanced dog food). * Treat balls or puzzles can be purchased so rather than just dropping dog biscuits in a bowls and your dog eats it straight away get them to work for dinner. Treat balls require that the ball is pushed a moved around so that the dog kibble falls out intermittently. This way of feeding fulfils mental stimulation and to a degree hunting behaviours. * Make you own ”treat ball” by using a coke bottle with holes poked into the sides. How about enriching your yard for your dog? * A strong rope tied to a tree with heavy bungee cords lets the dog pull and tug. Commercially designed ones are also available. This is a game that your dog can play even where you are not home. * Big boxes make great tunnels and many dogs will fit through the play tunnels sold at many childrens toy stores. A quick few comments on barking dogs as this is an undesirable, attention seeking behaviour that often results from boredom and is a common complaint from owners (or more frequently their neighbours). * How to control barking dogs? If your dog has already learned to bark excessively then you need to “re-teach” this behaviour. As discussed before choose a command such as ENOUGH and reward your dog when it falls silent. Persistence is the key with re-training dogs and remember DO NOT get frustrated and start yelling, work with positive reinforcement. Citronella bark collars are also available and are useful if you have a dog that barks while you are away. Many issues can be avoided if they are worked with from the beginning. Most dog owners are reactive (addressing issues after they become problems) as opposed to being proactive (not allowing issues to begin or get out of hand). Responsible pet ownership is best achieved when are proactive. So consider walks, playing games, toys, enriching meal time and the back yard and appropriate training using positive reinforcement by doing so you will have a happy and healthier life for you and your dog. 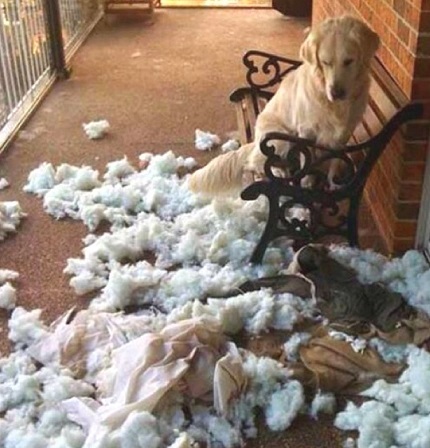 Boredom in dogs leads to undesired behaviours. However, enriching their environment, getting them socialized and understanding that we make our dogs what they are goes a long way in making our lives together happy and healthy. If you have any questions on behaviour feel free to discuss this with one of our staff members, book an appointment or look on line. Dr Cam Day is a specialist veterinary behavioural who has a fantastic website (www.pethealth.com.au) with loads of information and also performs telephone behaviour consults by appointment.